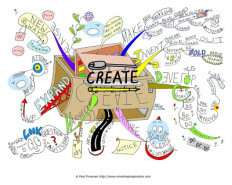 Our creative mind is the part of us that generates inspiration and insights and imagines what we want, and want to do; while our conceptual mind is the part that analyses and rationalises and tells us what we need, and need to do. For example, our creative mind may imagine a working life full of meaning and purpose while our conceptual mind is concerned about paying the bills. We become more creative by paying less attention to the surfaces (the things we think we need, and need to do) — and more to the depths (the nothingness that underlies everything, where imagination is ignited). This can be scary and is always exciting. It’s also safer than our conceptual mind likes to allow. We can trust our own creative intelligence. Albert Einstein once described our creative intelligence as “the most beautiful emotion we can experience…the [underlying] power of all true art and science.” It’s an intelligence that’s in us all, and we can bring it to the task of creating anything and everything, making our whole lives artful and knowledgeable. We don’t acquire this intelligence, any more than we acquire our fingers or our feet. Accessing it is largely a matter of removing the barriers we place between ourselves and its innate, powerful potential. Of quieting the churning thoughts of the conceptual mind. For me, it was the dentist that did it. In the waiting-room, mouth full of flame, trying not to hear the sounds of the oral black-and-decker in the room next door, I grabbed a glossy magazine, hoping to sink my psyche into a distracting article. The first was all about fly fishing, and since not even toothache could keep me enthralled in that, but then I turned the page and saw there a few words, a quote from Abraham Maslow, the renowned psychologist, and it was if they were written in great neon letters. Every so often, words change lives, and this was one of those times. Back then, my conceptual mind paid the bills by helping writers at the end stage of the creative process. It was my job to teach them about technique and help them to completion and publication, through a writing school and literary agency I ran in Dublin. Reading the article shifted my focus to the earlier stages of the process, to inception and intention and and germination instead. I set out to tackle Maslow’s “key” question of how inspiration is best fostered and encouraged and this started a journey that led me to university lecturing in Creative and Imaginative practice, to writing poetry, to switching to self-publishing, to writing a series of books about being more creative. But most importantly, it led me to the knowledge that the same process that makes one thing, makes everything. Maslow was right, a lot of us have either lost, forgotten or banished that knowledge to the back of the clock on our mental mantelpieces. So now I write and blog and speak about this creative intelligence of ours, about why in God’s name everyone isn’t creative, and where that human potential was lost, and how it is crippled. And I work in as many ways as I can to spread the understanding that creative imagining is not just for writers and artists, but everyone. If I haven’t lost you yet, if the idea of that excites and delights you, then welcome to the creative way. 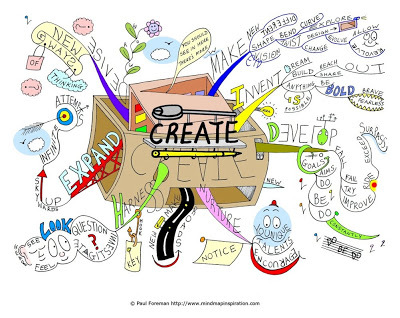 Attend a free online monthly “Be More Creative” Q&A (commencing June 2014). Begin to practice Inspiration Meditation or F-R-E-E-Writing and work out what you most truly want to create. Sign up right so I can let you know when I publish a new title in the Be More Creative Series. That is, if you don’t mind becoming the sort of person who makes life-changing decisions on the basis of passing comments in old magazines.